You’ll see that it is basically across all plans and all mailboxes, including shared mailboxes. Existing users won’t need to do anything, their mailbox will automatically increase sometime between now and November. This is yet further evidence to my mind of how fast Microsoft is bringing improvements to Office 365 so expect to see further updates coming thick and fast. 1. SkyDrive Storage for all users will be increased from the current 7GB standard to 25GB. 2. You can purchase additional storage for SkyDrive Pro beyond the new 25GB limit up to 100GB. 3. New Shared with Me view to located documents shared with you. This is great news and another indication of how cheap online storage has become. I would expect to see this limit continue to increase over time. The ability to add more storage to SkyDrive Pro was a limit for some users but now no more. 100GB of personal space is a HUGE amount of data for one person! As I have mentioned many time here in this blog, the future of collaboration is all about sharing and anything that makes that easier is good. One of the downsides to mobile devices these days is that they are generally pretty fragile. If they get dropped from typically waist height they seem to have an alarming ability to twist in the air and fall on their screens or a corner. In the worst case this results in a unusable device, in other cases a fairly damaged unit. Now many people need to use their phones in hostile environments where they really need more protection than a standard case or ‘bump’ can provide. This is where the Otterbox comes in. It is basically an enclosed shell that you insert your phone into and then you encapsulate that in a neoprene like skin. The result is a very protected device. 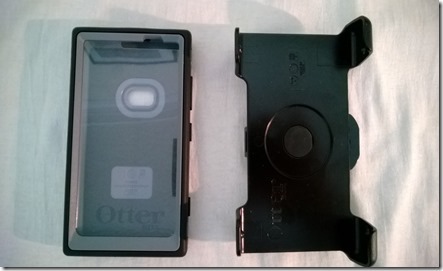 Initially when I opened the Otterbox I couldn’t work out how to get it open to insert the phone. Turns out that you need to remove the neoprene like skin from the Otterbox and then you can open the case to insert the phone. It fits snuggly and everything clips together with a resounding ‘click’. Once you place the neoprene-like skin back around the box holding the phone you need to ensure that it mated all the way up to the lip of the box. With all the done your phone is now pretty much indestructible. You can them clip the phone into the holder which you can attach to your belt. Again, there is a resounding ‘click’ when you mate the Otterbox to the holder. That says ‘it ain’t going nowhere’. Now there are some minor issues with the unit. Firstly, the hole for the external headphone jack doesn’t line up with the phone jack. You can of course still open the flap and still use any headset but seems strange that it doesn’t line up. The unit does have a number of locations where the elements could gain access to your phone, so don’t go thinking this is a waterproof container. 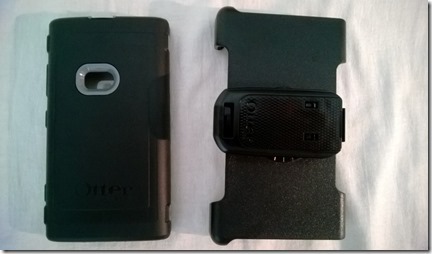 Having all this protection does make the phone that much bulkier and you really need two hands to get it on and off the belt holder which may prove a little tricky at times, however as something that will provide almost 100% protection for your Lumina 920 then this is the protective case for you. 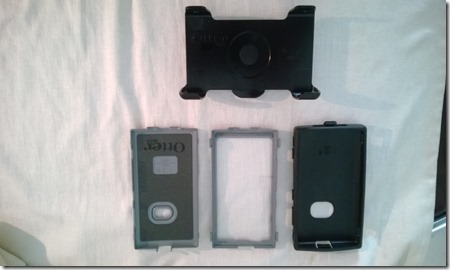 In summary, if you really need high end protection for your Lumia 920 so it will survive incidents that would render a other phones inoperative then this is the protective case for you. If you haven’t already seen it, here’s a great add for the new Nokia 1020 Windows Phone. It is getting plenty of acclaim out there and I still believe the Windows Phone platform to be superior to everything that is currently out there. If you haven’t looked at a Nokia Windows Phone then I’d suggest you go and have a look at how good these things are. The second fundamental difference is that Google Apps does not understand collaboration and here’s a few reasons why. 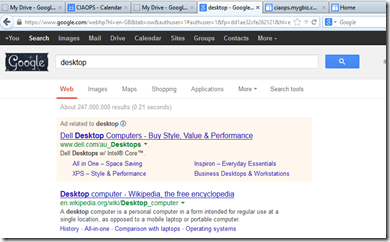 Google Apps and Office 365 are mainly about a suite of products. The main product most focus on is email. You know what? Email is a commodity. So many suppliers do it and there is not much real value or differentiation you can apply to email, in, as long as a business gets their emails who generally cares beyond that right? From a functionality point of view email is email and thus a commodity. Therefore whatever email functionality one provider has is generally the same as another provider so let’s agree to say hosted email systems are pretty equal. What I will tell you is that email is an ‘old world’ technology. Today’s world is all about sharing and making information public so that it can be shared rather than siloed in someone’s inbox never to be seen again. Why do you think Facebook has over one billion users? Today people want to SHARE information. As a business I need to collaborate on all sorts of information quickly and easily including, files, folders, calendars, contacts, tasks and so on. I will also tell you that those entering the work force now have little concept of traditional drive letters. They have no concept of C: and D: drives. They have no concept of network drives. They have no concept of mapped drives. To them it is simply data and the technology that gives them access is search. So the concept of files and folders in ‘traditional’ folders is really old world stuff. When you take a look at how Google Apps approaches data they seem to me to still be locked into that old world of files and folders. When you put files into Google Apps it goes into it’s own separate drive area. This is just like my old C: drive right? Can I add more columns or metadata around these files? Not from what I can see. Sure you can add a star but what about if I want to categorize files by customers? Again, just dumb old files and folders. How is that ANY different from what I did on my PC XT in 1984 in DOS? SharePoint by contrast provides a single web location for files AND folders AND calendars AND tasks AND everything in ONE PLACE in what is known as a Team site. 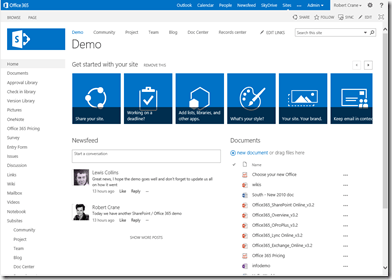 In the repository within the SharePoint Team Site that holds files and folders you can add as many columns as you like to describe your data. These columns can be text, numbers, dates or your a set of your own choices. You can sort and filter on multiple columns. You can create multiple views of the same data. For example you can change what file listings actually display to be just the file name if you want. That is collaborative thinking not simply migrating old world thinking to hosted storage as what Google Apps have done. In Google Apps if I want to move from Drive to my Calendar I click Calendar from the menu across the top. That opens a new browser tab with my calendar. But wait, isn’t that similar to opening a new application on my desktop computer by double-clicking an icon? Yup, it is. 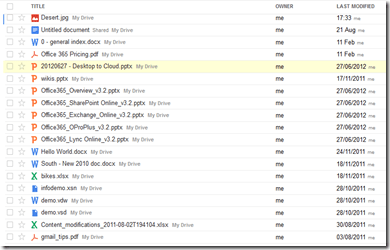 What happens if I return to the Drive tab again and click Calendar again? Just like double clicking on a desktop icon again it opens ANOTHER browser tab to show my calendar AGAIN, even though I ALREADY have a calendar tab open. Now I have two calendar tabs open. Again, old world thinking now just brought to you in a browser. In SharePoint, click on the team site calendar you are taken there. Click on tasks, you are taken there, just as you would expect in a modern web environment! Now let’s say that I want to create somewhere dedicated to a project. This will need a location for files and folders, calendar, contacts, emails, tasks and so on just for starters. How do you do that in Google Apps? I can go into another area and create a Google Site but then how do I get a common calendar there? How do I display my files? How do I create a shared tasks list? Again, old world thinking being one app for one job. I NEED collaboration not just storage. Ok, so let’s take something that Google should be good at, search. If I am in my Google Apps Drive area and I want to search for an item in a calendar I can’t, I can only search in my files. Why is that? If I need to find something I want to search from anywhere and find it. Again, I don’t want to be constrained in a siloed ancient world. I NEED collaboration. I NEED to get to my information from anywhere as I might not know where it is. When I use the Search option across the top in Google Apps I end up searching the whole web not just my data. This reinforces my first fundamental difference concept between Google Apps and Office 365. Google Apps is provided by an advertising business, who are principally seeking to maximise advertising revenue. Look at what is the top result when I attempt to search in Google Apps. IT IS AN ADVERTISMENT! Again, see my first fundamental difference. If I need to find something in SharePoint I go to the top right and and enter what I am after in the search box. Bingo, as you can see from the above I get results from file name, file contents, calendars, contact, tasks and basically everything on that site. I also get a preview of some document content embedded automatically on the page. 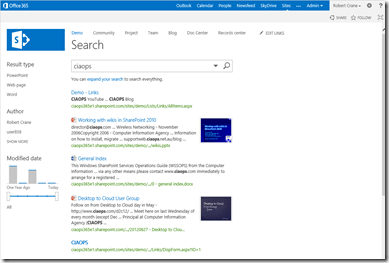 With a few clicks I can expand that search to every SharePoint site I have access to. I can filter the results by file type, author, date and so. Isn’t this what modern collaborative search is all about? I should be able to search across everything I have access to in one hit. I also don’t see ANY results or options to search any information but my own and I don’t get advertising unlike with Google Apps. As I said previously, the new world is all about social. 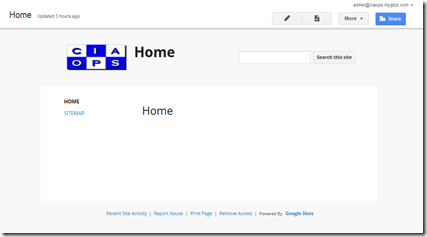 What happens when I try to be social in Google Apps? 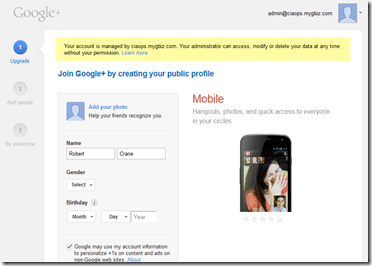 I am asked to join Google’s public social network Google Plus. What happens when I join there? Is my information private? Nope. Am I pushed more advertisements? Most likely. Without question, failing to integrate your environment with social abilities is really old world thinking. SharePoint by contrast has private social networking built in. It allows the integration with Linkedin and Facebook out of the box if desired. Microsoft is integrating the enterprise social networking product Yammer into SharePoint and Office 365 every day bringing more and more social functionality to their products. Why? Because social is the new way to collaborate, it is how things will be happening going forward in the modern age. I could go on and on with example after example of how Google Apps just isn’t a modern collaboration platform. Likewise, I could mention in contrast how SharePoint has inbuilt automation with workflows, how it allows you to work with groups of documents known as document sets, how it has inbuilt eDiscovery and more, oh so much more. Microsoft has been developing SharePoint since 2001 as a modern collaborative platform because it understands what collaboration means. Google Apps is still no where near a modern collaboration platform from what I see. They have a long way to come to even be in the ball game. When you boil their solution down, it is just like a normal desktop PC just with a different storage location. Old world stuff I am sorry to say. Google has brought email to a collaboration fight. I see a lot of chatter out there about whether Google Apps is better than Office 365 and you know what? I think they are overlooking a very fundamental issue. You can debate the various technical merits of each solution, compare the features point by point but I think this missing a far greater business distinction when it comes to these products. I covered this in a recent podcast I did on Eagle Tech Genius podcast but I’ll reiterate it here because I think it is very important. As a business, everything I generally do is focused in helping my business succeed. Success is generally measured via profit. Thus, this blog, my publications, YouTube channel, free downloads and so on is aimed at promoting my business with the aim to generate it more profit. Likewise Google and Microsoft are businesses. They have shareholders and it is their fiduciary responsibility to maximize the profits for these shareholders. However, what most people overlook is that Google generates the vast majority of its profit (over 80% I believe) from advertising. Now there is nothing wrong with this business model and it is very successful, however you need to appreciate that products like Google Apps are aimed at assisting the maximization of advertising revenue and thus profit for Google. I am not saying they are doing anything nefarious with Google Apps when it comes to advertising. What I am saying is that products is one of a suite that Google has whose aim is to generate additional advertising revenue. Microsoft on the other hand generates the majority of it revenue through selling software. Thus, it’s business model is about selling more software. As a business that chooses between Google Apps and Microsoft Office 365 you need to be comfortable what the business does who makes the product you use. Like I said, both products solve problems for customers but as a business are you more comfortable with a product from an adverting company or a software company? At the end of the day, how are they looking to maximize your contribution to their profit? In the episode I spoke about the challenges of IT security as well a key differentiator between Google Apps and Office 365 (which I’ll do a separate upcoming blog post on). I feature in the first part of the show but I encourage you to listen to the whole episode for some other great information for businesses. Once again, many thanks to Peter for inviting me on and I hope to be able to come back and share more information with listeners. If you are an IT Professional then you really need to be looking at PowerShell. Even for products like Office 365, PowerShell is the premier method of configuring and automating your work with the product. I would expect that all PowerShell modules for online components in Office 365 will increase in functionality over time, so make sure you check regularly for updates. Also, make sure that you spend some time at least learning the basics of PowerShell if you plan to manage these systems. I will plug my own book – Getting Started with PowerShell for Office 365 as a great place to start when it comes to PowerShell and Office 365.